August 11, 2018 - The Ethiopian Ministry of Defense Force denied reports that it has clashed with the Ethiopian Somali Liyu Force in an attempt to disarm the regional force in the Somali state’s capital of JigJiga. Officials of the Ministry of National Defense Forces disclosed on Saturday that members of the national defence force did not have any intention to disarm the regional forces. Rather the forces have already formed a joint committee which will be in charge of supporting victims to resume normal life. 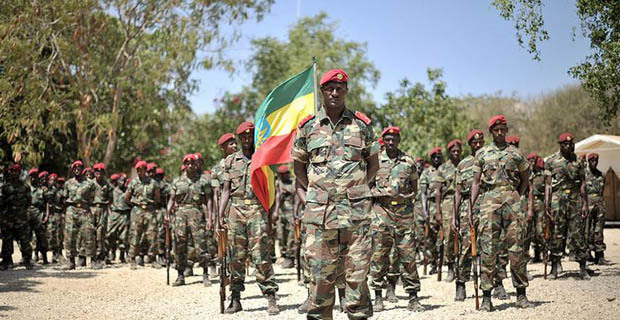 Previous reports had indicated that members of the Ethiopian defence forces clashed with local militia in the restive Somali region of Ethiopia. “The unfounded information was fictitious and spread by those groups who want to destabilize the state. Otherwise, both forces are working together along with the regional police," he added. He said relative peace has been realized after the national defence forces were deployed in the region but misleading information continues to horrify the public. Reports reveal that at least 10,000 people have been sheltered in religious institutions in JigJiga city alone. Some of the victims whom Ezega.com spoke to via telephone said there are critical food shortages and thousands of people are being held hostage in different areas. They fear that they would be subjected to communicable diseases if things continue as they are. Meanwhile, the federal government has transported 80 million birr worth of food assistance to JigJiga city. Somali State Supply and Logistic Head with Ethiopia’s Disaster and Risk Management Commission, Mr. Hassen, said the food shortage in the state is out of the control of region and the federal government has so far provided 7000 Quintals of rice, 5000 nutritional food, 8000 liters of cooking oil, 5000 Quintals of biscuit and 3000 flour to those affected by the violence.